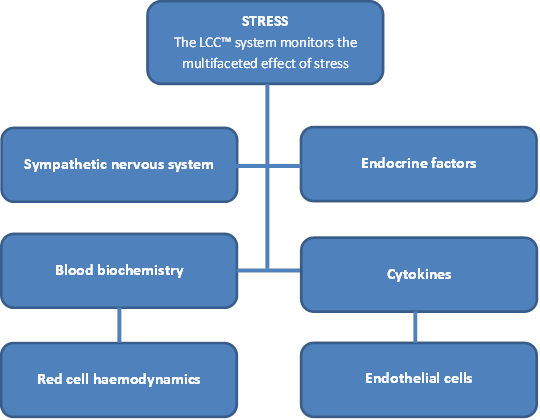 We have developed the Leukocyte CopingCapacity™ (LCC) stress test with one thing in mind: to produce the first point-of-care test for stress that makes it easy to determine how an individual is coping with the stresses he or she is under. What are the key features of the system? What is the ideal stress bio-indicator? There are over 250 mediators released in response to stress. Measuring a single mediator can be useful, but it does not tell the whole story. The ideal stress indicator would be the sum of these mediators. Our test monitors the multifaceted effects of stress using the body’s leukocytes primarily, but not exclusively, neutrophils) as bio-indicators. These cells circulate throughout the body picking up and responding to all of the signals of stress (indicated by the diagram below). What happens when our cells are stressed? When our cells are stressed, the mediators released by stress alter the responsiveness of the cells. We can pick up those subtle changes in reactivity with our simple test. How does the Leukocyte CopingCapacity™ test work? Leukocyte coping capacity (LCC) is a new measure of the ability of leukocytes to respond to an external stimulator and produce reactive oxygen species. This is affected by the immediate external environment in the blood. Leukocytes (primarily, but not exclusively, neutrophils) which have been exposed to stressors within the body will have a reduced capacity to produce reactive oxygen species in response to an external stimulator. This is the underlying technical foundation of the test, which uses a tiny pin prick of blood and gives results in ten minutes. What makes this test unique? The test informs you how well the body is coping with both physiological and psychological stressors (coping capacity). Adrenaline and cortisol and other hormones are useful indicators of stress, but the stress response is a highly complex response involving a cascade of mediators. Absolute values of individual mediators are difficult to interpret. For example, cortisol is subject to diurnal rhythms which vary throughout the day, and increased levels of adrenaline can be associated with excitement. Leukocytes have over 250 receptors which respond to the key mediators released during stress. They circulate throughout the body and can pick up even subtle changes in stress mediators. Because of their exquisite sensitivity to stress mediators, and their ability to respond to not only one, but hundreds of stress-related mediators, they are ideal stress detectors. They circulate throughout the body, so act as bio-mediators. The cells’ responsiveness is altered during stress. This test defines how well the body is coping with those stressors. It does not require specialist laboratory equipment. It is simple to use, portable and affordable. How have Professionals used this test? For example, an Olympic level coach used the LCC™ test to modify the training and life style of his athletes. Some went on to achieve lifetime bests. A unique, practical, handheld, stress test with results available in just 10 minutes. Our test uses the body’s white blood cells (leukocytes) as shown in the above photographs; the surface structure of the leukocytes changes when an individual is subjected to stress.